I got tired of all the little nags and errors. I tried hard resetting, upgrade to the latest official ROM, tweaks, and more, but there were always issues like the auto answer stopped working as well as the slide to answer, the nagging little notifications that an SMS was sent (DUH) and that my Bluetooth was on and so forth. I finally decided to void my warranty and flash a custom ROM to it. I was pleasantly surprised at how easy it was. Unlock. Flash. Done. Less than 30 minutes. With a hard reset, I always need to install my applications back to the device, with the custom ROM, most of them are built right in and I only needed to reinstall a few. I chose Energy ROM with CHT (Cookie’s Home Tab). Screenshot after the post. 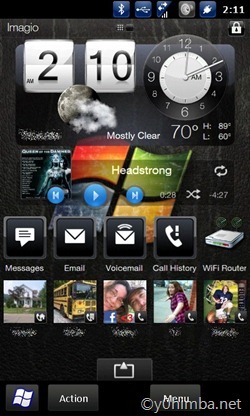 Interface is highly customizable and full of everything needed including Facebook and Twitter tabs. Packed with many great applications and ready to use immediately after flashing. Tweaks. You must tweak this ROM, remove items from startup that are not needed as well as services. Doesn’t remember some settings such as WiFi on during standby mode. This ROM needs to be optimized much more to use a lot less memory. 20mb should be shaved off to allow normal phone use. Just by removing the HTC Volume and Notification managers I saved 2mb, and shutting down the Facebook/Twitter tabs saves another 2-3mb allowing me to listen to music and use Bing for navigation. I was able to cut the pages from 3 to 2, and the level to just 2 which saved a bit more, and disabled tabs I don’t use such as Internet and Stocks. I feel there needs to be a balance between eye candy and resource usage. This is quite simply the best cell phone experience I have had since the days of my Razr. The interface and ROM are beautiful and convenient. Once the huge amount of memory the eye candy uses is smoothed out and optimized this ROM will be perfect.